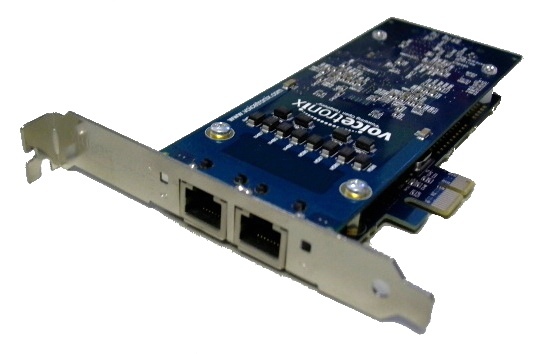 The OpenPCI(e) series offers a combination of loop-start (FXO) and/or station (FXS) ports on a half length PCI or PCI Express (PCI-e) bus form factor. Positioned as an entry level telephony hardware platform, it expands from 4 to 8 ports and is ideally suited for low voice traffic environments where connections to plain old telephone services (POTS) lines, analogue stations/handsets and legacy PBX phone equipment are desired. Traditional fixed line and IP based PBX phone systems. Interactive Voice Response (IVR) answering services. Automatic Call Distribution (ACD) systems. Auto Attendant or Announcement servers for legacy phone systems. CT Server, a client/server library written in Perl designed to be a rapid application telephony development platform for Voicetronix hardware. It is suitable for PBX, IVR, autoattendant and voicemail applications. 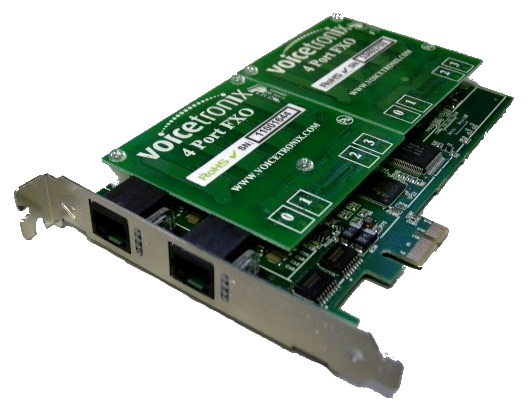 VTlogger, our voice recording/logging server used primarily to record calls in POTS and Digital Primary Rate (E1/T1) environments. OpenPBX, our very own easy to use web based PBX platform written in Perl using CT server. OpenPBX is currently being upgraded to support SIP. 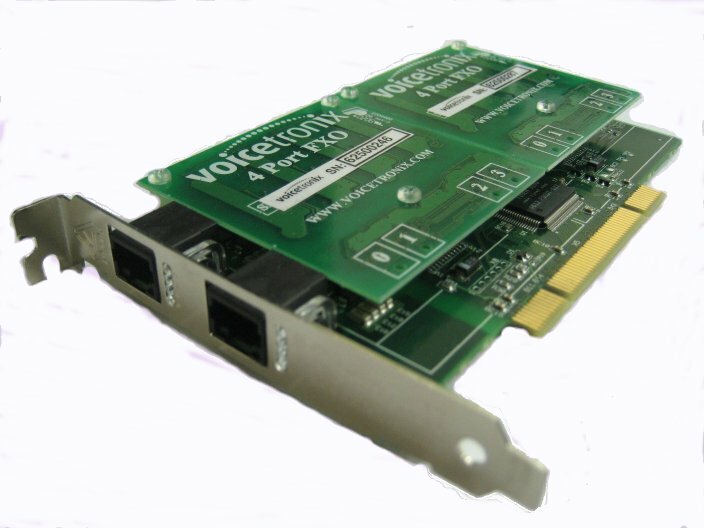 Choose from our range of OpenPCI hardware that best meets your telephony requirements below. 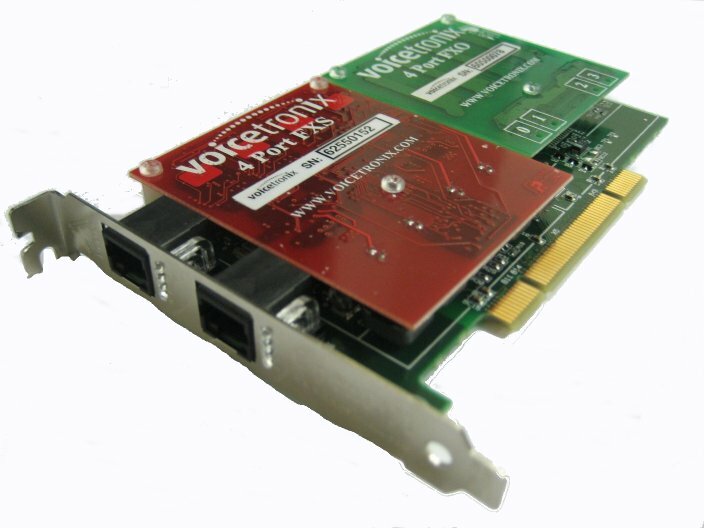 Note: PCI 2.2 version cards are subject to minimum order quantities (MOQs). POTS lines and legacy PBX extensions. 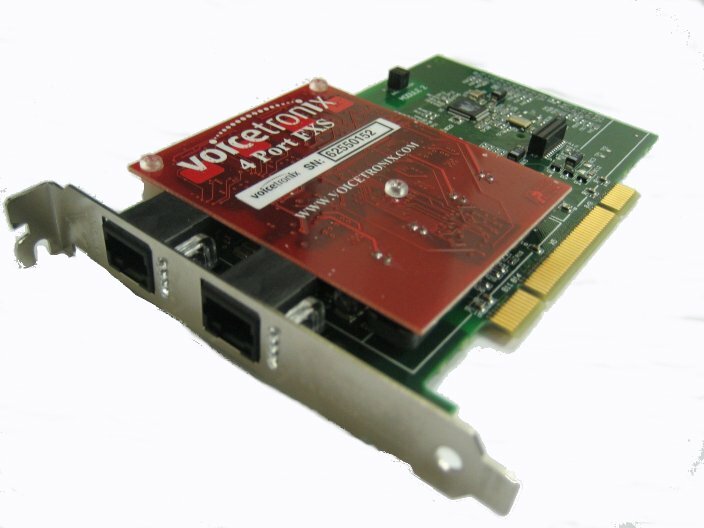 Can be used in High Impedance (Hi-Z) mode (tapping) for call logging/monitoring purposes. Analogue handsets/stations and fax machines. POTS lines, legacy PBX extensions, analogue handsets/stations and fax machines. Primarily used to build PBX phone solutions. 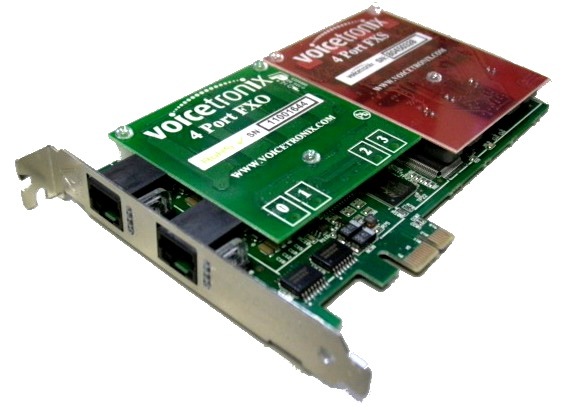 Half length PCI (5V or 3.3V) or PCIe form factor. Install in a wide range of motherboards and chassis sizes. 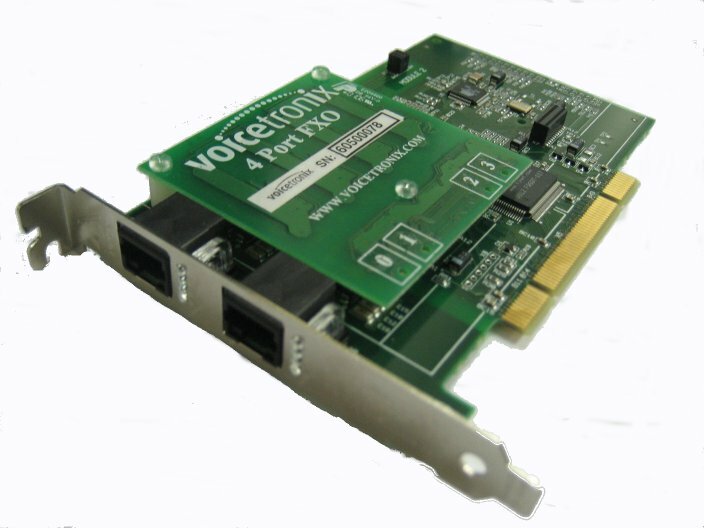 The PCIe version also offers significantly higher bus bandwidth enabling more telephony cards to be installed on a single server. LEDs adjacent to each RJ45 connector. Indicates activity on each port on the card. Eliminates the need for on board DSPs and their associated resources, thereby reducing hardware costs and power consumption. The fact that it is open source and on the host PC server enables you to possibly modify code to suit non standard telephony environments - No emulators or simulators required! Open Source Software Development Tools and Applications. Speeds up development, provides total design and maintenance control and eliminates vendor lock-in, all at zero cost! Accessories such as Splitter/Breakout Boxes, Failover Boxes and Audio Input Adaptors as optional extras. Offers standard telco connections to the card, the option of power or PC failure redundancy and the ability to connect to microphone/headset type jacks. The OpenPCI makes available two RJ45 sockets, allowing you to connect up to 8 ports. 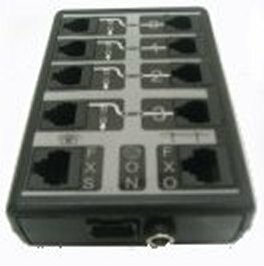 Voicetronix provides optional Splitter Boxes to separate ports on each of the RJ45 sockets into four individual RJ11 sockets making it easier to connect to POTS lines or telephone handsets. The Failover Box is recommended if there is a requirement to preserve basic telephone functionality on Power or PC failure. It offers a controlled method for trunk lines failing over to specified analogue handsets/stations. Knowing that you can still make and take calls in the above mentioned circumstances offers you piece of mind that your communication system won’t leave you completely stranded. It inherently offers the Splitter Box functionality as well. 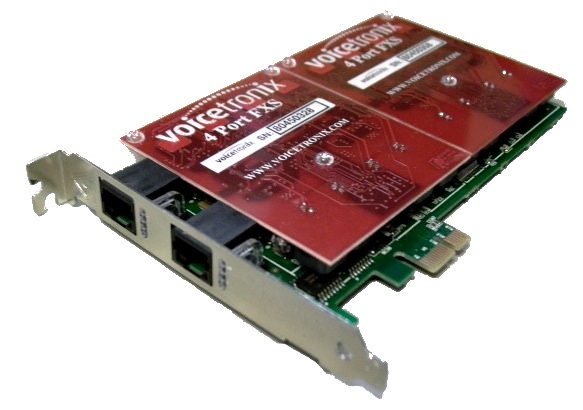 You don’t have to be using Voicetronix hardware to benefit from the Failover Box. When combined with our Splitter Boxes, the Failover Box may be used with other vendors' telephony cards that supply only RJ11 sockets. Such cards include Digium’s TDM800P, Sangoma’s A200 and Rhino's RH8Fxx series. We even have customers connecting them to Cisco appliances. For more information check out our downloads page and download the Failover Box manual. 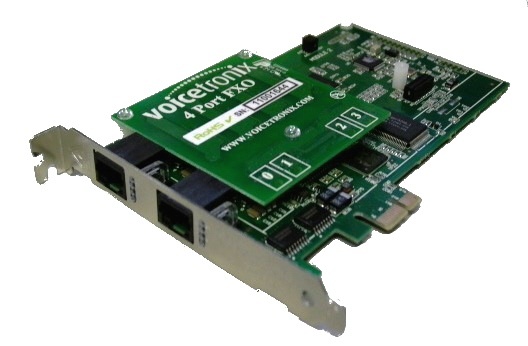 Voicetronix also provides an optional multi-configurable Audio Input Adapter that connects the FXO Ports on the OpenPCI card to mono, stereo, balanced or unbalanced audio signal sources including radio, DVD or MP3 players. Connects to the OpenPCI cards via the RJ45 socket. Connects to POTS lines,legacy PBX extensions and analogue handsets via the RJ11 sockets. Need 2 for the 8 port versions of the OpenPCI cards. Connects to the OpenPCI-8LS card via the 2 x RJ45 sockets. Connects up to 4 POTS lines and 4 analogue handsets via the RJ11 sockets. Serial communication is made available by connecting the serial interface on the Failover Box to the PC server's USB port via our modified serial RJ45 to USB cable. Connects to the OpenPCI L series via an RJ45 socket. Each adapter connects up to 4 audio channels via the 0.25" jacks. Need two of them for an OpenPCI-8L card. All you need to build your next telephony solution is a PC server running Linux, an OpenPCI card and some open source software! If the DIY option is not for you then contact sales for a pre-configured or custom solution. Small business hybrid PBX system supporting both analogue and IP handsets. Take a PC server with an OpenPCI-8LS card running Linux (ie. 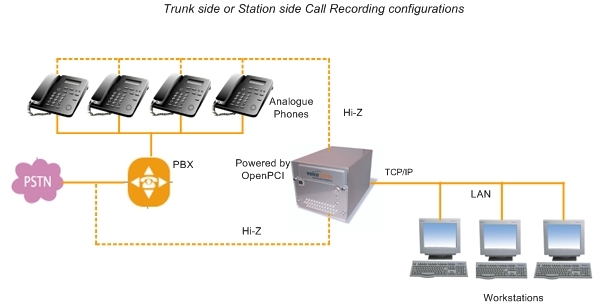 Telephony server) and connect the card's FXS ports to the analogue handsets (and/or fax machine) and its FXO ports to the telco trunk lines (PSTN). Connect the IP handsets, if any, to your computer network (LAN) together with the telephony server and then install, configure and run our hardware driver and OpenPBX. Note: Digital handsets usually found in legacy keyed telephone systems (KTS) are not supported. Providing call logging/monitoring functionality to existing phone systems. 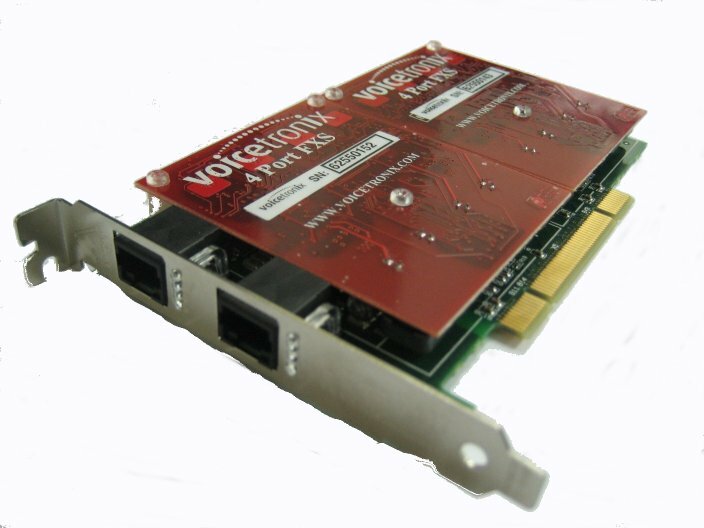 Take a PC server with the OpenPCI-8L card running Linux (ie. Telephony server) and tap the card's ports to the telco trunk lines if only incoming and outgoing calls need to be monitored. If inter-office calls are also required to be monitored, then tap the PBX extensions instead of the trunk lines. Install, configure and run our hardware driver and VTlogger application software. Note: Only the tapping of standard analogue handsets is supported. Digital handsets found in keyed telephone systems (KTS) cannot be tapped using our technology. CPU/Speed Intel Core i3 and AMD equivalent or greater. MOBO/Backplane Supporting 3.3V Power supply, PCI2.2 or PCIe bus. Operating Temperature 0 to 60C. Form Factor Half length PCI/PCIe. Board Status On board LEDs. Number of Ports 4 and 8. Port Types Trunk (FXO) and Station (FXS). 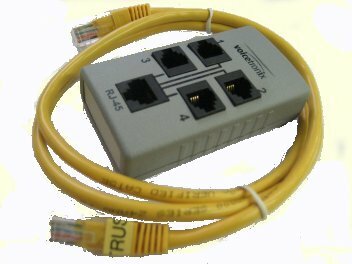 Phyiscal connection 2 x RJ45 each supporting 4 ports. Echo Return loss (ERL) 20 dB (min), across range 300Hz - 3400Hz. Ring Detection 13.5Vrms (min), frequencies 13 to 68Hz. Trunk Modes Terminating or passive. Trunk AC Impedance Software selectable for global compliance - 16 settings supporting 70 countries. High Impedance (Hi-Z) in passive mode. Trunk Signaling (Terminating Mode Offhook/Onhook, Polarity reversal, Line Voltage, Flash, DTMF, Ringing. Trunk Signaling (Passive Mode) Onhook Line monitoring for recording purposes and CallerID type I, II pass thru. Station AC Impedance Automatically calibrated. Station Signaling Detection DTMF, Offhook/Onhook, Flash. Station Power Source Onboard integrated DC-DC converter. Sampling 8 bit companded ADC-DAC sampling @ 8kHz. Frequency Response 300Hz - 3400Hz. Trunk Transmit/Receive Digital Gain Software configurable (-15dB to 12dB). Station Transmit/Receive Digital Gain Software configurable (Mute to 6dB). Echo Cancellation OSLEC - 8 to 32ms tail. DTMF Detector/Generator 0-9, *, #, A, B, C, D.
Tone Detector/Generator Software programmable - suitable for call progress tones. Software Development Kit (SDK) Voicetronix GNU LGPL API library and utilities (libctpp).